-My dad suffered many strokes (some small, some not so small), and after each one he would work mightily to get back the function of his limbs, and his ability to communicate verbally. To my relief, he usually made it all the way back to full functioning! After one rather subtle stroke however, he lost his ability to speak. His frustration with not being able to recover verbal expressions lasted six months, then a year, until we both realized it was likely permanent. Each week I would pick him up to go to church; it was the one outing that would always fill him with hope and good cheer. His life-long friends attended the same church, and for many decades he joined them in the choir. After he realized he could no longer control and produce intelligible sounds, he began finding alternate ways to let people know what he needed or felt. Understanding his attempts was often a hit-or-miss exercise, unless he wrote everything down. In a social situation, especially with his many church pals, it was often impossible to write out his side of a group conversation. Sometimes, his friends assumed he was not involved with what was being said, since he began to sit back and just listen. However, I'll never forget the day when he finally found a way to let everyone know he was not only listening, but was cheering them on silently. In the middle of an inspiring church sermon, begun just after a deeply touching song by his friends in choir, he began squirming just a bit in his pew seat. He took up the cane lying next to him and reached to place his hat on the handle of it. 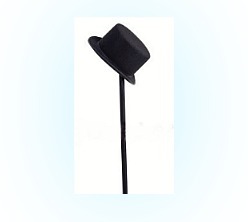 Then, he slowly raised the hat-on-a-stick into the air in front of him and slowly waved it back and forth. The entire church could see the bobbing hat clearly, and a hush came over the sanctuary. With great love and patience, the minister look at my dad, nodded to him and said, "I'm glad someone's listening today!" and caused a great release of laughter from the congregation. We all felt so proud of my dad, doing whatever he could to let his friends know he was moved by their song, and the services! It taught me that even in the most daunting circumstances, it is important to find ways to overcome our own inadequacies, and to risk being vulnerable to let others know that we want to share and improve our relationships. My dad’s been gone for almost five years now, but whenever I feel down, I remember that singular hat floating with hope and warm intentions above the crowd.